Based on the above categories, we sketched the one-gradient conceptual space of emotional feelings [Figure 1], where Panksepp's basic emotions can be located in a single line (from Unsatisfying to Satisfying) according to their valence. This illustration does not allow, or intend to provide for, a precise location of emotional feelings in the conceptual space; for instance, it does not analyse the features of different satisfactory feelings, such as satiety, gladness and happiness. Figure 1: One-Gradient Conceptual Space of Emotional Feelings. In Panksepp's work, the above emotional states are putatively generated mostly by means of the action of neuropeptides. These molecules carry very specific actions [Table 1] while the combined actions of neuromodulators elicit general mood states. This landscape contains two gradients: Pleasure-displeasure and surprise-anticipation; therefore, we represent the conceptual space of neuromodulation of emotional feelings by means of a quadrant [Figure 3]. 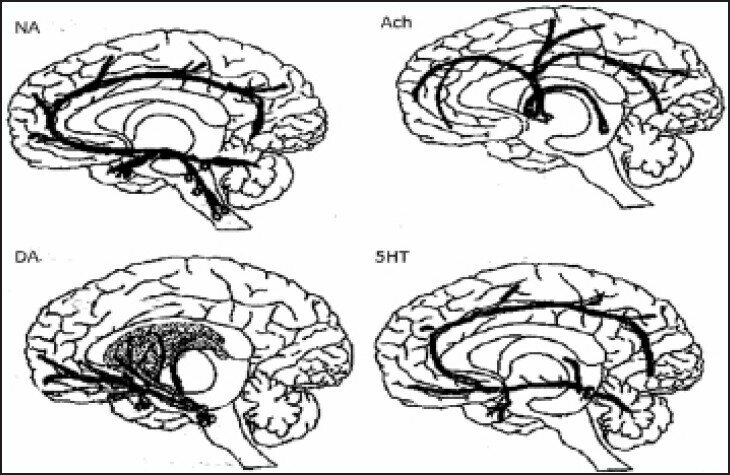 Human affective dynamics is a very complex process involving the action of several brain electrochemical agents and psychosocial factors. In this paper, we make an approach towards a simplified model related to the action of four neuromodulators and respective psychoactive drugs used in psychiatry to treat affective disorders. We begin by making some conceptual definitions and assumptions: affective disorders are disorders in the dynamics of emotional feelings, which are conscious phenomena driven by the action of neuromodulation. What is the relation between emotion, feeling and affective disorders? How many basic emotional feelings do human beings have? What is the relation between different kinds of neuromodulation and different kinds of emotional feelings? How does the combination of different kinds of neuromodulation and/or corresponding psychoactive drugs used in psychiatry determine human mood states? How do neuromodulators interact with neurotransmitters and brain hormones (neuropeptides)? Ekman P. Emotions inside out 130 Years after Darwin's “The expression of the emotions in man and animal”. Ann N Y Acad Sci 2003;1000:1-6. Ron D, Jurd R. The “ups and downs” of signaling cascades in addiction. Sci STKE 2005;2005:re14. Fushun Wang PhD, is a full professor in the Department of Psychology, Nanjing University of Chinese Medicine, and also Adjunct Professor in the Dept of Neurosurgery, University of Rochester in New York. Dr. Wang got his PhD at Zhongshan University with his thesis being done partly in University of Oxford. Then he did several postdoctoral trainings in University of Medicine and Dentistry, Thomas Jefferson University and Brown University. Later, he was appointed assistant professor in University of Rochester in 2007, and in 2013, he was appointed Jianshu Special professor in Nanjing University of Chinese Medicine. His major research interest is probing into the neurophysiological relationship between neuromodulators and emotions. Alfredo Pereira Júnior PhD - Adjunct Professor of Philosophy of Science at the São Paulo State University (UNESP) - Undergraduate Courses on Philosophy and Administration - Master (1986) and PHD (1994) in Philosophy of Science - Post -Doctoral Fellow at the Dept. of Brain and Cognitive Sciences, Massachusetts Institute of Technology (1996-1998) - Researcher granted by the Brazilian National Research Council (CNPQ) 2001-2013, project on the Science of Human Consciousness, and Sγo Paulo Research Foundation (FAPESP) 2012-2015, with two projects (Self-Organizing Systems and Triple- Aspect Monism).